If you want to see the world, cruise down its legendary rivers. To see more of the world, look no further than Avalon Waterways®. Avalon ships feature one-of-a-kind Panorama SuitesSM with the widest-opening windows in river cruising, the industry’s only Open-Air BalconySM and beds that face the incredible views. Looking for more hands-on experiences? Avalon’s new Active & Discovery river cruises down the Danube, Rhine and Rhône rivers offer a deeper immersion in each destination. Explore the culture, sights and adventures waiting beyond the shore in the most active, engaged and fun ways imaginable. Learn some of the local language—and then go try it in a café or pub. Take a painting or cooking class. Catch the sights as you jog through a city or canoe down a river. Every port gives you a world of possibilities as you choose the dynamic, interactive activities that appeal to you most. It’s the Old World in a whole new way! Your Active & Discovery river cruise can be as active or leisurely as you like. Choose from Active, Discovery and Classic shore excursions in each port. An Active & Discovery cruise is packed with Avalon Choice® inclusions for every pace in every place. Book Your Avalon Waterways Active & Discovery River Cruise Today! Call your cruise specialists at Bluegreen Travel Services at 855.645.2215 soon to book your Avalon Waterways sailing. Here are just a few of the itineraries available in 2019; 2020 Active & Discovery cruises are also available for booking now! Browse the Habsburg Empire’s art collection or sip local vintages at an Austrian wine tasting. Sample cheese and beer made by Trappist monks and explore their Abbey gardens. Choose an insider’s tour of Vienna or join a canoe excursion to see Austria’s waterways and shoreline. Hike to Count Dracula’s prison tower or visit Belvedere Palace in Vienna to see Klimt’s renowned “Kiss.” Attend a Medieval Knights Tournament at a Visegrád castle or explore Budapest your way: classic sightseeing with a local guide, biking through town on a guided ride or learning a few Hungarian phrases on a walking tour. Westbound Active & Discovery cruises on the Danube also available. Extra nights in Linz or Budapest available for an additional charge; call for availability and pricing. In Amsterdam, jog through the city, take a canal cruise or attend a painting class where you’ll learn to recreate the masterpieces of Dutch artists. Discover the U-Bahn subway line and architecture of Düsseldorf, or see the Old Town on a biking tour. Visit Cologne’s Chocolate Museum or take a guided walk past Cologne’s twin-steepled gothic cathedral. Explore caverns where basalt was mined in Mendig. Take a cable car ride in Koblenz up to Ehrenbreitstein Fortress for magnificent views of the surrounding area. Take a guided nature walk through Eltville’s idyllic forests and vineyards, or enjoy a wine tasting in the historic Old Town of Eltville am Rhein. 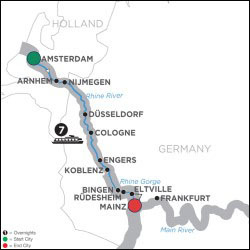 Northbound Active & Discovery cruises on the Rhine also available. Extra nights in Amsterdam or Frankfurt available for an additional charge; call for availability and pricing. Paddle a canoe in Gorges de l’Ardècheor or hike in the Natural Reserve of Cirque d’Estre. Stroll Avignon’s papal palace or enjoy a wine tasting in an underground cave. Admire the scenery of the French countryside, join a culinary walk to discover Lyonnaise specialties or attend a cooking workshop in Lyon. Take a ghost tour in Viviers or a guided e-bike ride through the birthplace of rosé wine. Tour a chocolate factory, visit a museum of French perfumes or see a surprising side of local culture at a crocodile farm and botanical garden. 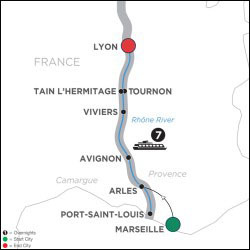 Southbound Active & Discovery cruises on the Rhône also available. Extra nights in Lyon or Marseille available for an additional charge; call for availability and pricing. Call 855.645.2215 to Book Your Avalon Active & Discovery River Cruise Today! Prices are shown in U.S. dollars. Prices are per person, for cruise only, based on double occupancy. Gratuities are included for services during the land stay of your vacation. This includes wait staff at included meals, hospitality staff at hotels for nights purchased through Avalon, and porterage at hotels for one suitcase per person. Gratuities for your Cruise Director, Local Hosts, Local Guides, driver, and ship’s crew are not included in the vacation price (unless otherwise noted in pricing details) and are discretionary. The following charges are not included in the land/cruise vacation price, unless otherwise noted: airfare to and from the start of your vacation; intra-vacation air, unless specified in the itinerary; airline baggage fees including checked and/or excess baggage fees; Federal inspection fees for the Federal U.S. Customs and Immigrations; International Air Transportation tax; agricultural tax; other per person taxes imposed by government entities; airport taxes and fees, including the September 11th Security fee up to $11.20 per person, passenger facility charges up to $18 per person, Federal domestic flight segment fees up to $4.00 per segment, and U.S. and international arrival and departure and other government-imposed added by the airline and applicable at time of booking; port taxes; passports; visas and vaccinations; tips to your Cruise Director, Local Host, driver, Local Guides, and/or ship’s crew; gratuities on ferries, trains, and cruise ships; laundry; telephone; minibar; alcohol, beverages, and food outside of the contracted Avalon menu as presented at a hotel or restaurant or onboard your vessel (these extra items will be billed to you before leaving the hotel, ship, or restaurant); airport transfers on non-qualifying flights; optional excursions; porterage at airports and train stations; Travel Protection; and all other items of a personal nature. See complete Terms and Conditions. Great Vacation Destinations, Inc doing business as Bluegreen Travel Services, is located at 4960 Conference Way North Suite 100, Boca Raton, FL 33431. Great Vacation Destinations is an Iowa Seller of Travel No. 688, Washington Seller of Travel No. 602-283-711; Florida Airlines Reporting Corporation (ARC) registration No. 15-72225-4, California Seller of travel registration No. 2068362 (Registration as a Seller of Travel does not constitute approval by the State of California). Void where prohibited by law and where registration and/or licensing requirements have not been meet. In the event of a conflict between Avalon Waterways’ Details of Participation and Great Vacation Destinations’ Details of Participation, Avalon Waterways’ Details of Participation shall govern.